Every few months I pull this pattern from my stash and think about making it up. Finally last week I decided to go through with it. 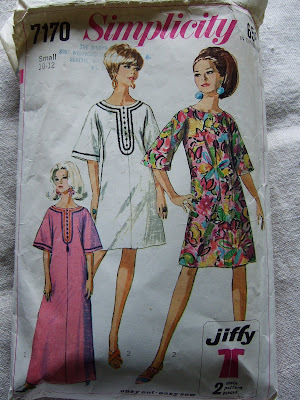 It's Simplicity 7170 with a copyright year of 1967. There's nothing to dislike about this pattern. It's quick to make and easy to wear. It's a great piece for going out for dinner or drinks, and when the weather cools off I'll wear it with tights. I shortened the length and made the sleeves a bit wider for more of a kimono effect. I also widened the neck. The pattern included facings for the neckline, instead I just finished the neckline like a t-shirt with a 1.5" strip of fabric. 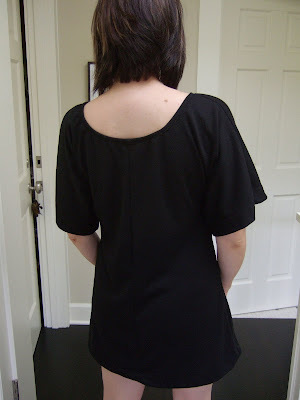 Also, the pattern included a facing for finishing the sleeves; instead I opted to just turn the edge under and stitch. The center front and center back seams provide minimal shaping; if I were to make this again in a print, I'd just cut the front and back pieces on the fold; the front has a bust dart which is what really matters. I added asymmetric pockets, and that was actually the most time consuming part of the construction. I'd really love to make this up in a Missoni-style knit, so I'm keeping my eyes peeled for that. It's beautiful, hot and trendy! I like what you did with the sleeves and the assimetrical pockets, it adds a special touch to this garment! You'll be able to wear it through Fall and that's great! This is fantastic, as is the blouse below. Me? I sewed zilch this weekend and am really wishing that wasn't the case now. The pockets really do add to it. I'd love to see it in a pattern. This looks fantastic on you! How cute and trendy is this? That looks great! How do you have time to get so many things done? It's people like you who make me think I can start making my clothes instead of buying them... Can't wait to see what you have next! I think I wore something like that in the late 60s! *LOL* It is really cute on you and will be fantastic in a Missoni! Great dress! Your blouse looks awesome too!! omg Definitely, it would work with both wovens and knits.